Firstly, HAPPY NEW YEAR! I know, late to the party - again. But hey, whatcha going to do about it? I cannot believe 2014 is upon us. Life seems to be moving far too fast! I hope you all had a lovely New Year, celebrating the opportunities to come in 2014. I had a quiet night which was perfect for me and my family. I am not massive on New Year Resolutions. I feel if you want to change something, you shouldn't wait until the New Year. You can make a change whenever you decide to. However there is a couple of changes I would like to make involving both the blog and just some general beauty and life resolutions. This is actually a pretty big one for me, I have been a subscriber to Bella Box since they launched over two years ago. I used to be a big supporter of them and Violet Box until I realised I hardly ever use the products in the boxes. Lately I am pretty much always disappointed in the boxes. I have decided I would rather save the almost $38 a month and put it towards a luxe item I actually want and will use. I am a notorious impulse shopper or just shopping because I feel like something new and want to spend money. This year I want to stop buying random things I haven't heard anything about just because they are new in Priceline or on the Mecca Cosmetica website. I only want to buy things when I have actually taken the time to consider whether I need them and will use them. "You don't have to own EVERYTHING"
When a new collection launches that I love, I automatically decide that I have to own IT ALL. Even if I won't necessarily wear it all or I have a lipstick that would be an exact dupe. Nope. I want it all. I need to remind myself that I don't need to own it all, just the couple of items I like and will use. Or that I don't have to purchase something from every new Chanel collection (all though this seems a little impossible). I realised recently that Luxury on the Lips is not travelling in the direction I originally intended. I wanted to write a blog about the gorgeous, luxurious products that are in my stash and that I purchase. Not a monotonous routine of empties, favourites, sample boxes and a couple of random reviews thrown in each month. That was not my blogging plan and I have decided to get back to my original ideas (and definitely feature many more of the luxurious lipsticks I adore). I want to do more FOTD's, Top 5 Products and reviews as collections are released. I think I have a similar resolution every New Year (and a few times during the year). This year I am not going for the 'diet' resolution though, I want to change my lifestyle and be healthier. I want to eat better (meaning less chocolate and junk), exercise more and try to wean myself off my Pepsi Max addiction (4 cans a day is probably considered an addiction). This one is pretty straight forward - I want to reduce the amount of beauty products I have. I want to use up a lot of products I have been keeping because I didn't want to finish them - stuff that! They are going to be finished. I also want to cull some of the very unloved or unliked items in my stash and pass them on or chuck them. I have recently remembered that if I want to achieve my dreams that I need to work for them. They will not fall into my lap, I have to do the hard yards and make some sacrifices. This year I want to achieve more with this blog, my job (which I want to turn into my career), my personal life and my studies (which I am resuming after 18 months deferment). So, there are my 2014 Resolutions, pretty simple and ones that I think I should be able to stick to. As I mentioned, I feel that Luxury on the Lips has lost its way a little over the last 12 months and I want to fix that. So it is unlikely that I will post monthly empties and favourites posts. Lately they have felt forced and I want to change it up. I want this blog to better reflect me, I swear I am more interesting and relaxed than recent posts have seemed. I plan to write a 2013 favourites post in the next couple of days but I just first have to actually decide on them. There are some no-brainer products but also those that become so essential I forget about them. Also a couple of days ago Luxury on the Lips turned 2 years old! OMG! Thank you all for your support and sticking around for the ride. Blogging has been fantastic for me, it has given me an outlet, helped me meet some lovely friends and allowed me to write about what I love - BEAUTY! 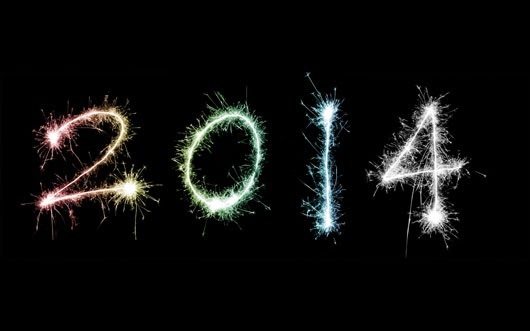 I hope 2014 is a wonderful year for you all!